The setting, consequences and social issues surrounding shootings and homicides in Wisconsin's largest city are the focus of "Too Many Candles: Milwaukee Gun Violence ," a new Wisconsin Public Television documentary. Produced by Frederica Freyberg, the piece examines how poverty, educational disparities and decades of controversial urban policies  in Milwaukee shape the largely African-American neighborhoods that suffer most from gun violence. In 2015, Milwaukee's homicides were overwhelmingly concentrated in majority-black zip codes in central and northwest portions of the city. One of those zip codes, 53206 — bounded generally by I-43 on the east, West Capitol Drive on the north, North 27th Street on the west, and West North Avenue on the south — has become social-science and media shorthand for the violence, hunger, lack of opportunity and sense of hopelessness plaguing Milwaukee's poorest residents, most of them people of color. 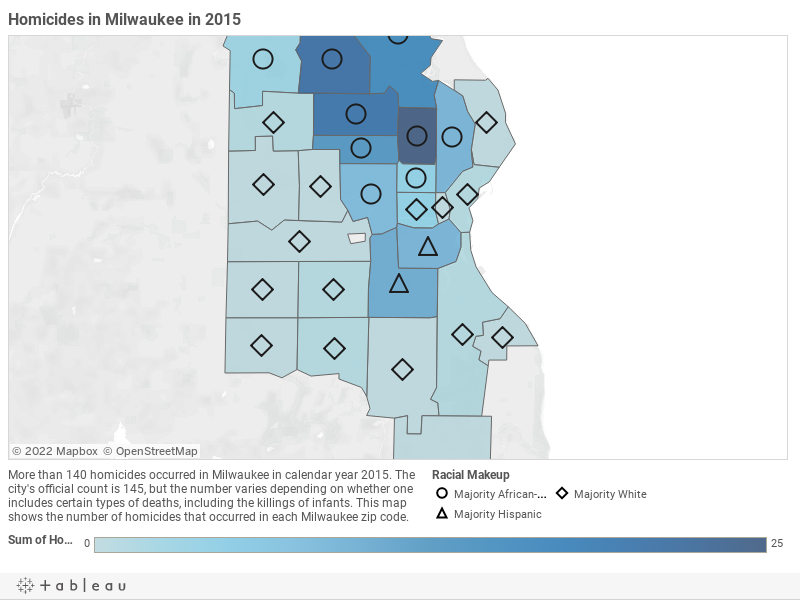 Although 53206 has the highest poverty rate of any zip code in the city and very high incarceration rates , homicide numbers show how social and economic factors collide across a much broader swath of Milwaukee, which has attracted increasing notoriety for being among the nation's most racially segregated cities . Although crime, poverty and other social factors often overlap, mapping these factors in Milwaukee shows dramatic divisions that align with the city's racial segregation. Of course, analyzing U.S. Census data by zip code is not perfect, and as some journalists and the makers of the recent documentary "Milwaukee 53206 " have stressed in pushing back against the zip code trope, no community should be defined solely by its ills. But the data do shed light on pressures facing victims (including the families and communities of those killed and wounded in violent crimes) and perpetrators of gun violence in Milwaukee. In zip codes where the highest numbers of homicides occurred in 2015, residents are less likely to have high-school degrees. These are also zip codes where the population tends to be strongly dominated by a single racial identity. As "Too Many Candles" notes, Milwaukee Public Schools are undertaking an effort to provide trauma resources for children — yet another instance in a statewide trend  of schools trying to fill gaps in mental health services. In much of northern Milwaukee, even people who have health insurance or can afford out-of-pocket health-care costs may have trouble finding convenient access to therapy and other mental-health services, federal statistics show. A large area of the city is a mental health professional shortage area, a designation  the U.S. Department of Health and Human Services confers on geographic areas that have high ratios of residents to providers (like psychiatrists) and/or have unusually high mental-health service needs. Milwaukee shares this problem with most of Wisconsin's rural areas. 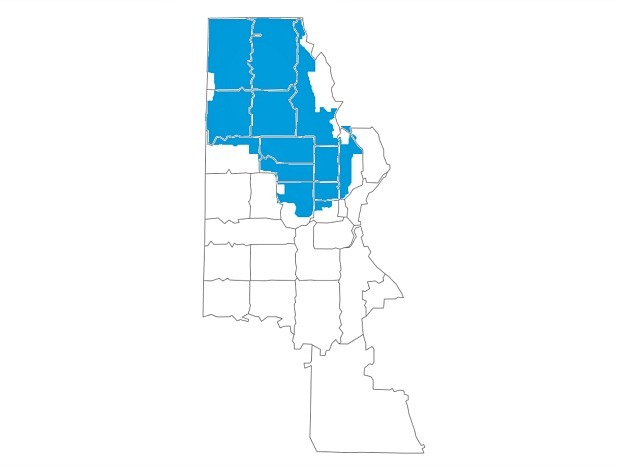 Of Wisconsin's 72 counties, 44, in their entirety, were designated shortage areas in 2013, in addition to portions of Milwaukee and Rock counties. 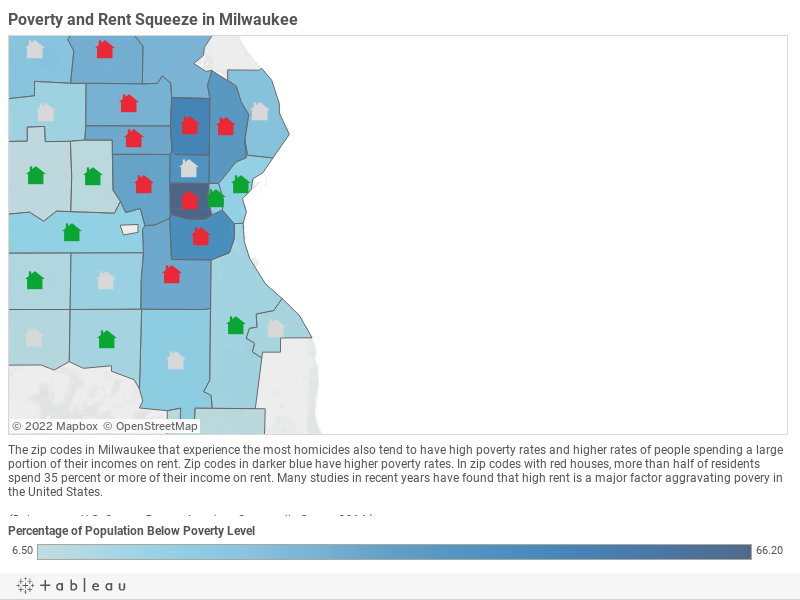 Not all shortage areas in the city of Milwaukee are exactly the same in their ratios of residents to providers or in their demand for services, but geographically they correspond closely with the sections of north and western Milwaukee that align with the zip codes that experience the highest rates of poverty and violence. These areas of Milwaukee are also where renters are the most financially strained. Poor Americans "are facing one of the worst affordable housing crises in generations," Harvard sociologist Matthew Desmond  wrote in a 2015 issue brief . A University of Wisconsin-Madison graduate, he spent about 15 months living in Milwaukee to conduct research on housing insecurity and eviction, yielding many data and publications, including the book "Evicted: Poverty And Profit In The American City ." Published in March, "Evicted" unites statistical analyses of eviction patterns with journalistic accounts of the lives of individual Milwaukeeans experiencing eviction, highlighting the experiences of landlords and repeat evictees. Desmond argued  that eviction has come to affect poor black women to much the same degree that incarceration has affected poor black men. In a recent interview  with the non-profit How Housing Matters project, he said sociologists need much more data on evictions, but the Milwaukee Area Research Study  he led between 2009 and 2011 found that 13 percent of low-income private renters were "involuntarily displaced from housing in the two years prior to being surveyed." These evictions disproportionately struck black and Hispanic Milwaukeeans. In his 2015 report, Desmond noted that two-thirds of families living below the poverty line in the United States receive no public assistance, and he showed housing assistance for the poor has not kept up with rising housing costs. Rent is also taking up a bigger cut of poor Americans' income. In 2013, 1 in 4 American renter households spent 50 percent or more of their income on rent, a 2015 study  by Enterprise Community Partners and the Harvard Joint Center for Housing Studies found, and the problem will only get worse. U.S. Census Bureau data don't quite capture this proportion of household budgets dedicated to housing. The census measures "gross rent as a percentage of household income," but the highest category it uses is "35 percent or more." Therefore, available census data do not aid investigations of where the toughest of the tough rent squeezes are in Milwaukee. But the "35 percent or more" measurement, assessed by zip code, reinforces the pattern of disparities in Milwaukee. Desmond considers eviction to be not just a cause of poverty, but also a challenge that keeps the poor from escaping their circumstances. As he explained in a March interview  on Wisconsin Public Television's "Here And Now," an eviction can have insidious cascading effects, ranging from unemployment to interrupting children's education. Desmond's work provides additional evidence that these are not simply factors that coexist geographically, but rather a complex of related issues that can feed into one another, contributing to gun violence that claims innocent victims. "It's no longer to the point where if you don't hang out at the wrong places or with the wrong people, then you have nothing to worry about," Milwaukee's 17th District State Assembly Rep. LaTonya Johnson  said in WPT's documentary, "Too Many Candles." Indeed, simply living in the midst of segregation and economic neglect is itself a risk factor.